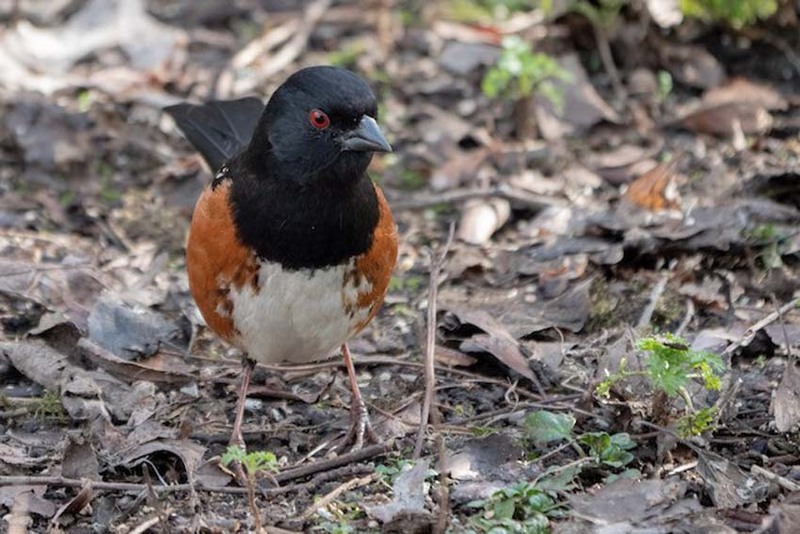 Butyl Creek has been a busy place in the last few weeks, what with the Great Miserable 2019 Beacon Hill Tennessee Warbler Stakeout and various snowstorms. 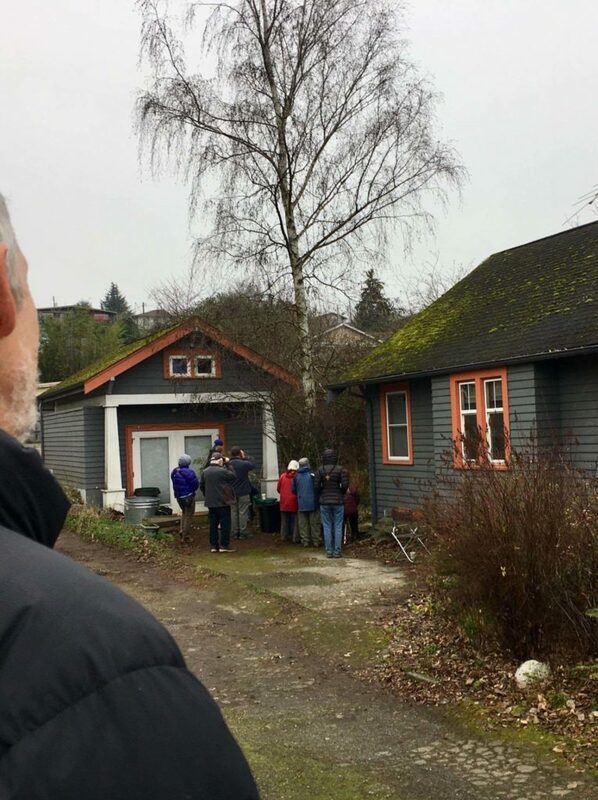 The stakeout brought at least 40 or 50 people to the creek and quite a few of them came armed. (The Constitution guarantees the right of open-carry of long-lenses). Grace and Ollie only got a glimpse of the Tennessee Warbler but took some great shots of other birds. 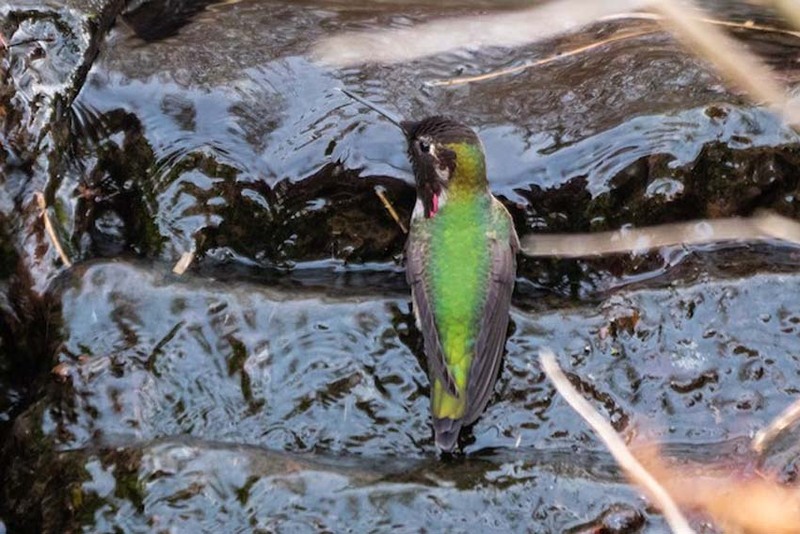 This one of a male Anna’s Hummingbird at the top of Butyl Falls (not as high as Angel Falls) taken by Ollie Oliver blew me away partly because of its beauty and partly for the information that it dispenses. Look at that tiny, tiny bit of red, but look how that spot of red owns the picture! Anna’s don’t always appear to be the handsomest of hummers, but in this shot, Anna’s isn’t giving any ground to anyone! 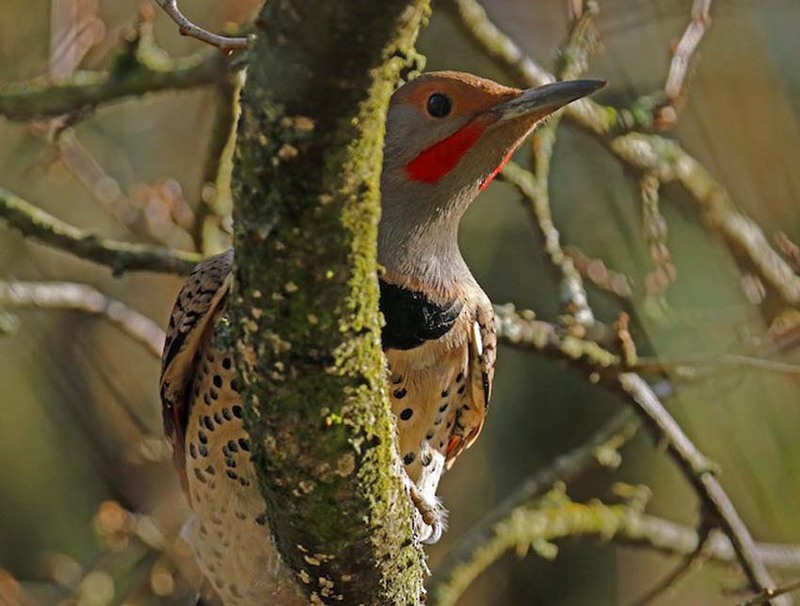 We also have an especially colorful Northern Flicker visiting regularly, and Blair Bernson got this shot, which feels intimate and is beautifully sunlit. 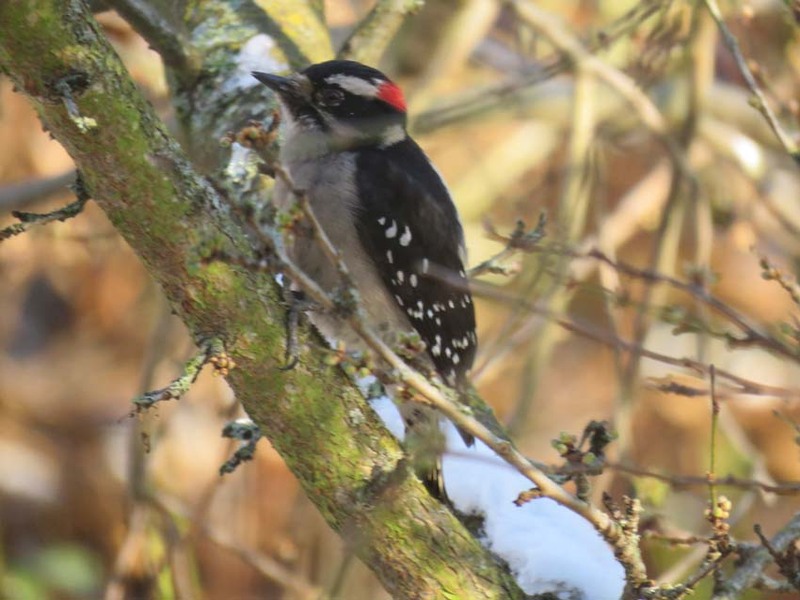 The obstacle that the branch presents to the full view of the bird adds rather than subtracts from the impact of the photo. 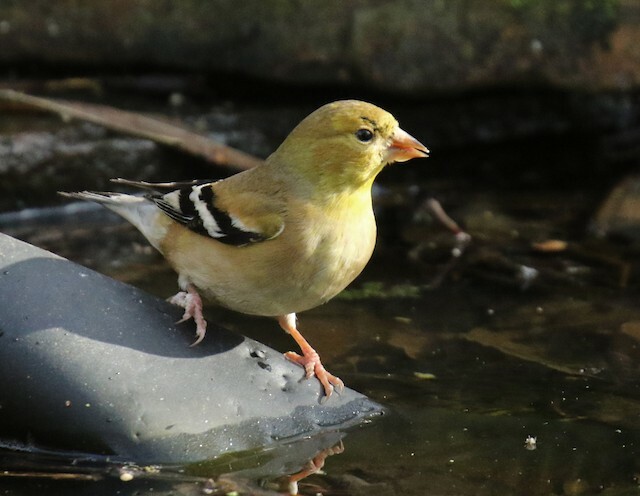 This sundrenched shot of an American Goldfinch by Blair Bernson is spectacular, except for one thing: The butyl rubber lining of the water feature called Butyl Creek is in plain view, and might not seem as picturesque as a moss-covered rock. Blame me, I’m a lazy landscaper! Here is the TEWA stakeout during the golden days when the bird was actually pretty likely to show up in the yard for 5 to 9 minutes a day, and take a bath. This photo is by Darchelle Pendleton and that’s Brian at left. 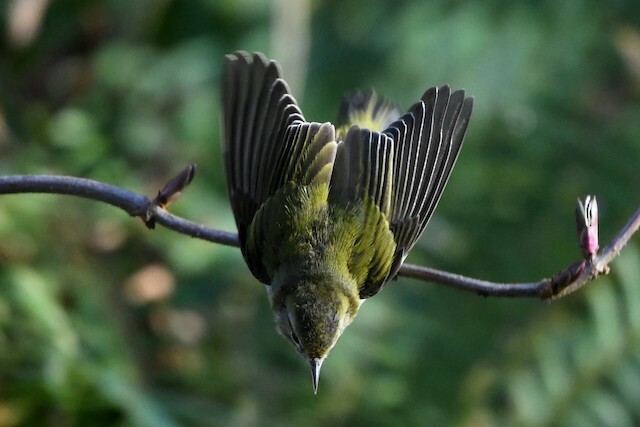 This was the Tennessee Warbler (TEWA) that many saw and many didn’t. We fear now, with all the snow and cold weather, for its survival, as it is many thousands of miles north of its tropical wintering grounds. We’re still burn a candle for it and would be delighted if it were to show up and disprove our supposition. This shot by Alexander Sowers was perhaps the most moody shot taken of the bird, enhanced by it’s contrast with the background, and one of the few where the bird didn’t appear to be in constant motion. This shot by Blair Bernson shows what jumped out at me from the beginning, the slender profile and sharpness of the bill, plus it’s overall two-tone look. 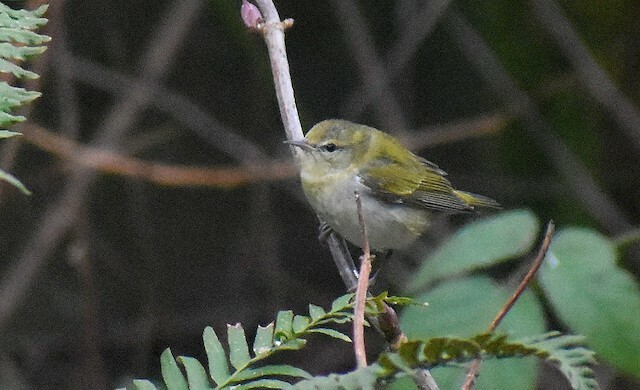 A Tennessee Warbler was also seen repeatedly and photographed well in Olympia at about the same time. 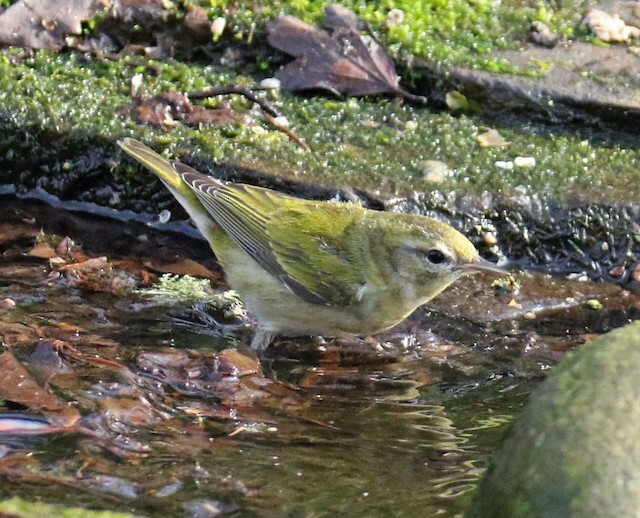 That bird apparently was a female and was much yellower overall with less white on the underside, except the under-tail coverts, which were snow-white and nearly as long as the short tail, which the species is known for. 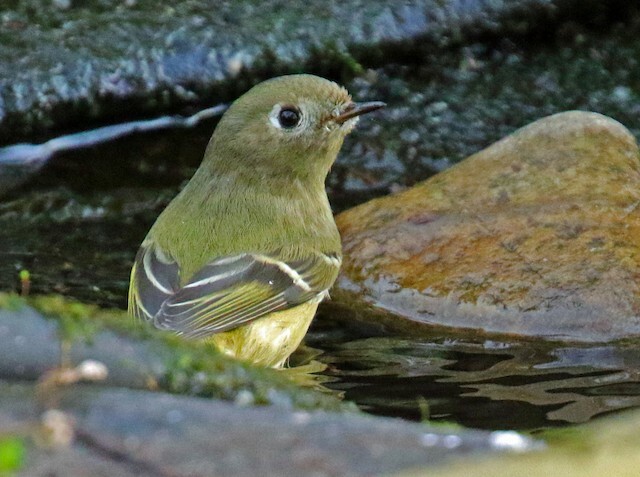 That bird would have been much easier to mistakenly have called an Orange-crowned Warbler, which is an regular resident bird in season in Washington. 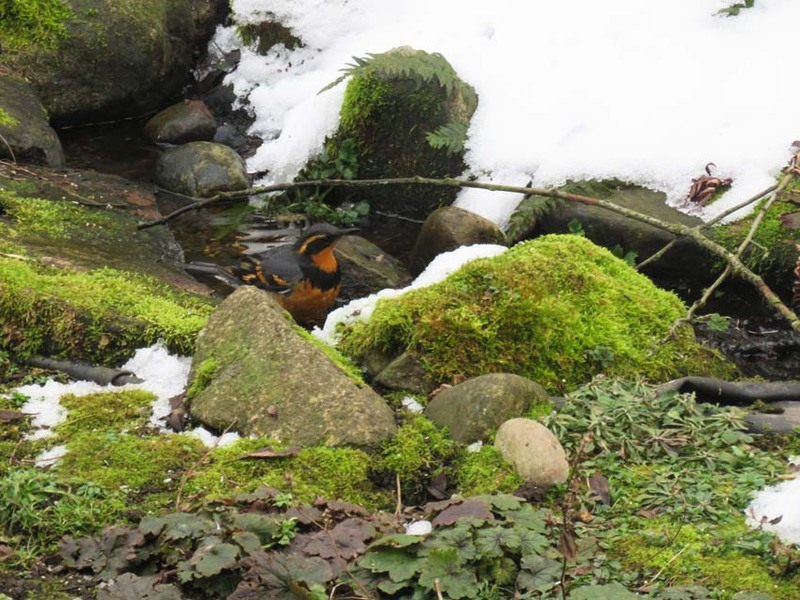 When the snow and cold descend on the Cascade foothills, two species start showing up in the residential zone: Red-breasted Sapsucker, which we haven’t seen, and Varied Thrush, our gorgeous Northwest emblem. 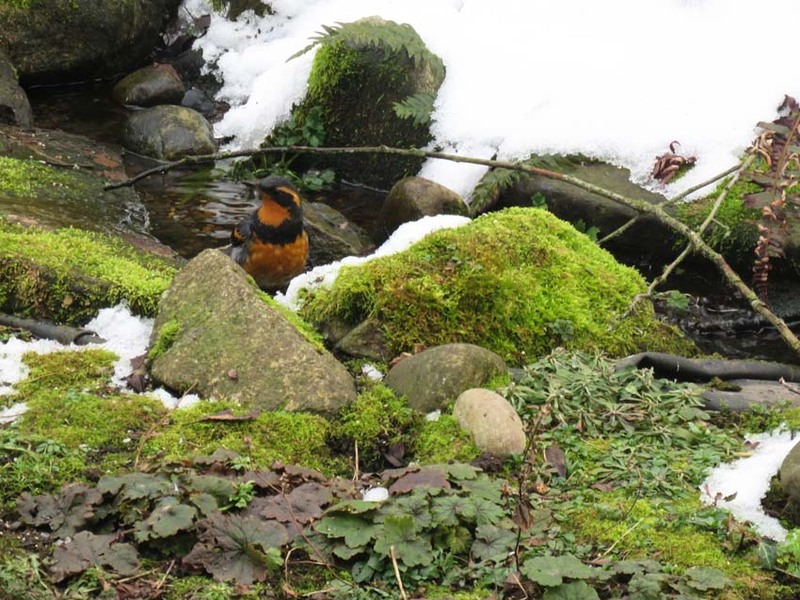 Varied Thrush are beautiful and have a most ethereal song loved by hikers in the mountains. This shot I took today. 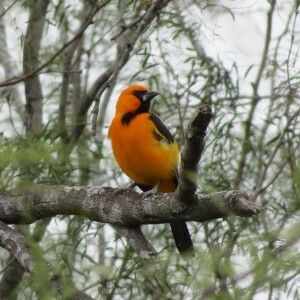 Another shot of this bird. Butyl Creek today. Pumphouse Lake is on the right. 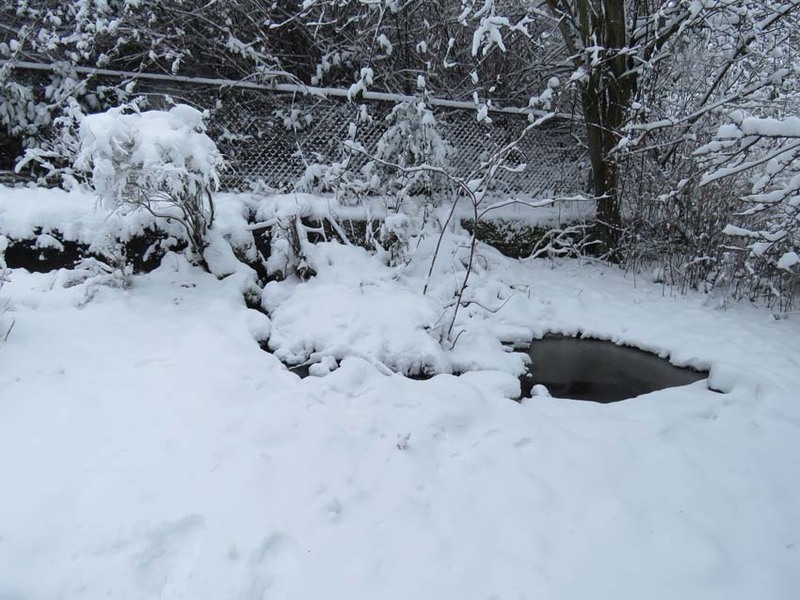 It’s a pretty wet snow much of which melted on impact, the way it should in Seattle. 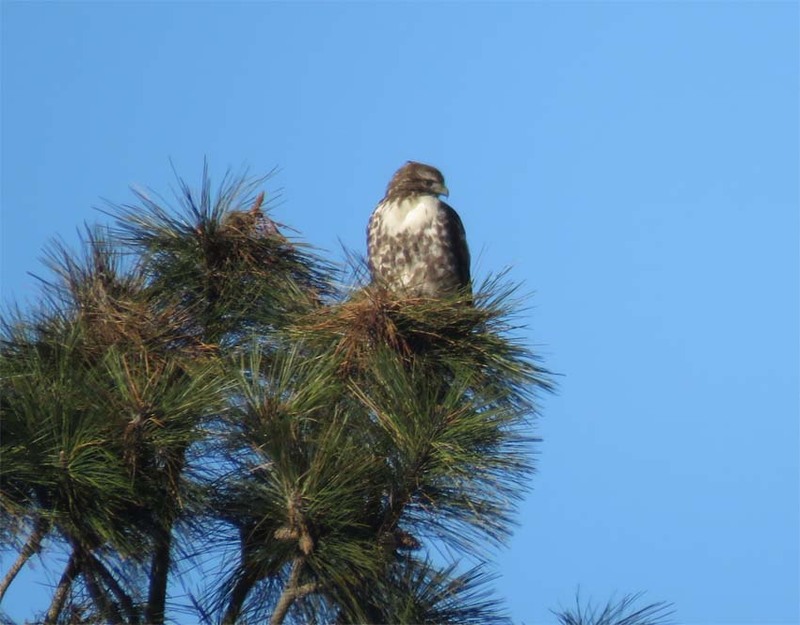 This Red-tail today across the street behind a neighbor’s house waited stoically for the Crows to quit bombarding it. 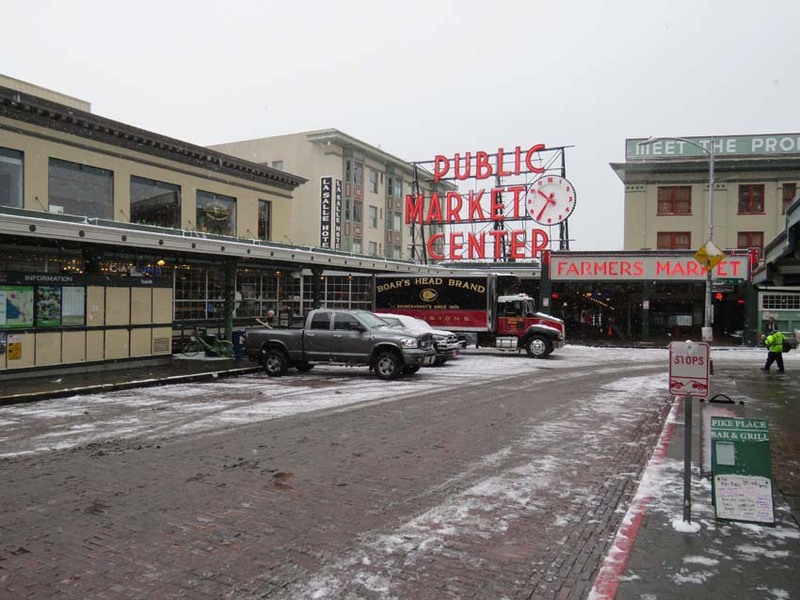 Got in to the Market on Monday on the light rail but the snow was already on the run. 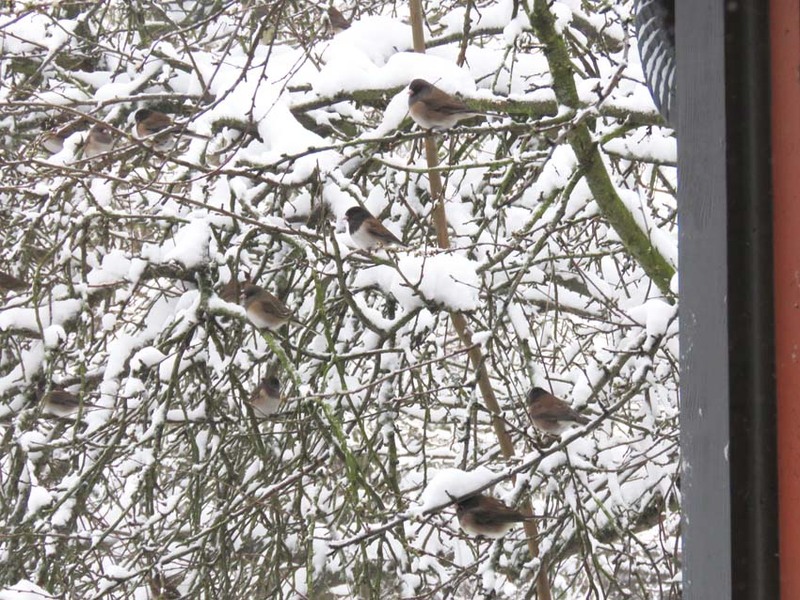 What a wonderful day it turned out to be, as others have been also in this snowy time. To continue to stray from the topic, I’ll end the blog with this shot from Alki. It’s blurry but I love it anyway. 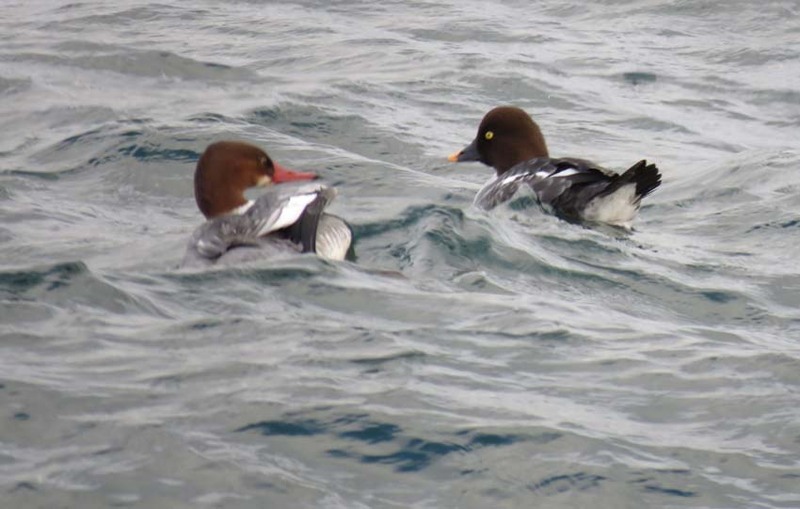 A female Common Merganser and a female Barrow’s Goldeneye appeared to be getting along famously. (EN) (I had previously incorrectly called the duck on the left a Red-breasted Merganser but I should have seen the sharp line between the red and white on the neck–thanks Ryan M! ).